UNITED NATIONS, October 11 -- The UN now plans to move all of its staff out of its 42nd Street headquarters in order to renovate it, rather than one-third at a time. Secretary-General Ban Ki-moon first alluded to this change in his toast to U.S. President George W. Bush on September 25. In a closed-door briefing on October 10, his Capital Master Plan staff told member states on the UN's Fifth (budgetary) Committee that construction time can be reduced from six years to three, and that while more so-called "swing space" for relocated staff will have to be rented, it will be for a shorter time. The Fifth Committee will formally take up the proposed changes on November 9. Ban Ki-moon and his close advisors, Inner City Press has learned, will still not be leaving the UN campus, under the new plan. Thought was given to moving them to the UN's library, which faces 42nd Street. 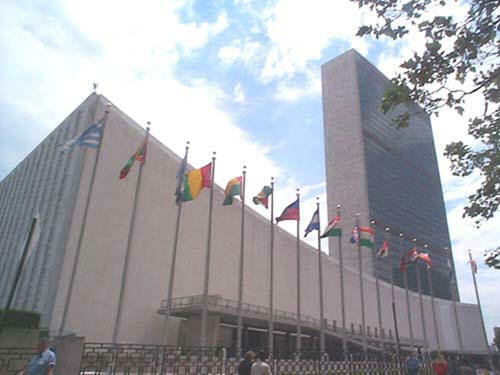 Then due to security concerns, the decision was made to house Ban's office in a larger Temporary Conference Building to be build on the UN's North Lawn. The UN Staff Union, which had been on record as opposing the previously-planned staged renovation, ten floors at a time, is still concerned about staff who would remain in the General Assembly and Conference buildings during the renovation. The Union is also requesting a commitment that those moved out of the Headquarters tower be allowed to return. "It will be like the Wild West," a Union official told Inner City Press on Friday. "To the strongest go the spoils." There is also a prediction that the rented temporary space could end up costing three to four times the renovations costs. Even as budgeted, swing space costs would jump over $150 million, from $233 million to $390 million. On July 27, the UN announced that it has chosen Swedish conglomerate Skanska as CMP construction manager. As Inner City Press first reported that day, Skanska was fined $25 million earlier that month for bid-rigging and operating a cartel in connection with other construction projects. Michael Adlerstein has been named executive director of the CMP; it is said that Ban Ki-moon asked and told Adlerstein that the renovation should be changed to all-at-once, and speeded up, and Adlerstein has said it can be done, notwithstanding questions raised by the Fifth Committee. The CMP's October 10 presentation stated that while "in July 2007 the Board of Auditors reported that the project was one year behind schedule and $148 over the approved budget," now in October 2007, "we are approximately $219 million over the approved budget." The CMP Powerpoint presentation states, under "impacts of acceleration," that "project completion date changes from 2016 to 2013" and "no additional funds needed." Fifth Committee members, some of whom were "pre-briefed" by the CMP staff, still have questions. In response to Inner City Press' CMP questions at the UN's noon briefing on Thursday, spokesperson Marie Okabe said that the formal consideration will take place on November 9. Developing.